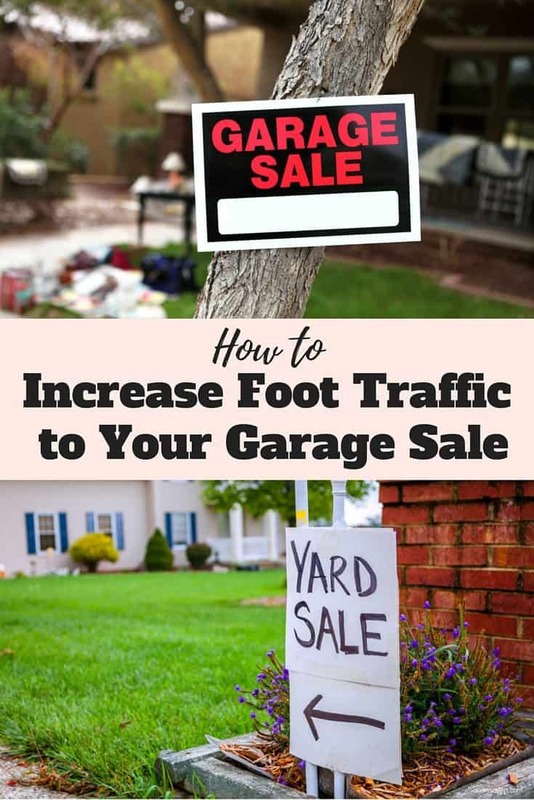 Garage sale season is in full swing, and if you have a great deal of junk to get rid of, having a garage sale is the perfect way to earn some extra cash as you get rid of it. Here are some essential tips from Maurine Anderson for hosting a successful garage sale. People who frequent garage sales tend to check online classifieds for garage sales in their areas. Craigslist is the most important place to list your garage sale ad, so be sure to post an ad within the week leading up to the sale. As for content of the Craigslist ad itself, be sure to include the sale date, times, exact location (it can help to mention a nearby landmark here), and a general list of items to be sold along with brief descriptions as appropriate. Include photos of the most valuable items to be sold as well. It may seem archaic now, but many savvy garage sale shoppers still check local newspaper classifieds about local garage sales (this includes the online versions of your local newspaper classifieds). It can help to check your local newspaper’s listing habits beforehand so you know what garage sale shoppers have come to expect from the local newspaper. Have your ad run starting the day before the sale, to the day(s) of your garage sale. As for ad content, guidelines here are similar to those for Craigslist. Use an attention grabbing headline, and then include details about the address, date, times, and items to be sold. In addition to advertising at the usual outlets that people go to for finding local garage sales, you’ll want to do some advertising on social media. On Facebook, it’s a good idea to create an open event with details on location, date and time, and what you’ll be selling. Promote the event as a post on your Facebook page if you have one, encouraging locals to share the post. If you have only a standard Facebook profile, invite your local friends to the event, encouraging them to invite others who might be interested. On Twitter, post a few tweets in the week or so leading up to the garage sale, linking to an advertisement on Craigslist if you have one. And on Instagram, you might post a few photos in the week or so leading up to the garage sale and encourage followers to tag local friends who might be interested in the comments. One thing to keep in mind as you post on social media—the images you use will make a big difference in whether or not you garner traffic. This article offers a brief guide to proper image sizing for various social media platforms. Post signage around the neighborhood to direct people to your sale. This is essential for directing people to your yard sale the day of. Before putting any signs up, be sure to check any local ordinances concerning sign placement and what can or cannot be written on the signs. As for your signs, simple is best here. You can make the signs using poster board and markers or you can purchase premade garage sale signs. 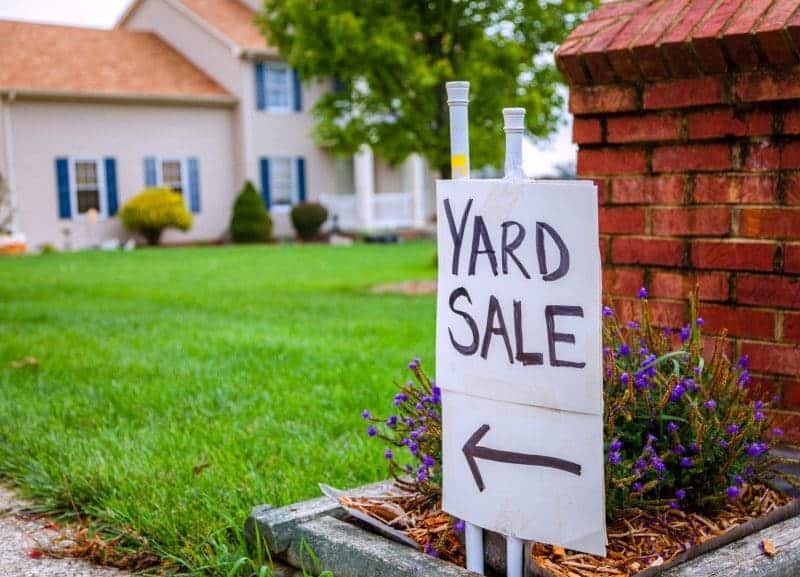 The signs should read “garage sale” or “yard sale” in large print and include an arrow pointing to where the sale is. It’s also a good idea to include the abbreviated date and time (such as “5/19, 7 a.m.–2 p.m”). If local ordinances do not allow you to post signs on stop sign and street sign posts, you can alternatively add the same info to the faces of several large boxes and then fill these large boxes with bricks, placing them at strategic intersections around the neighborhood. Or, you can purchase yard sale signs that come with wire stakes that can be pushed into the ground. Post your signs the night before the sale. Then, the morning of your sale, check that your signs are still there. It’s a good idea to attach balloons to your signs at this time (again, as allowed by local ordinances). 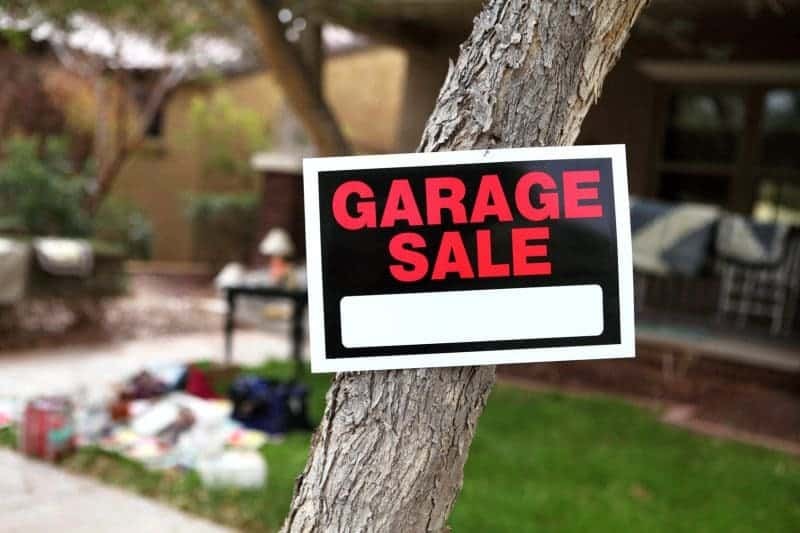 Be sure to take down all signs as soon as your garage sale has ended! 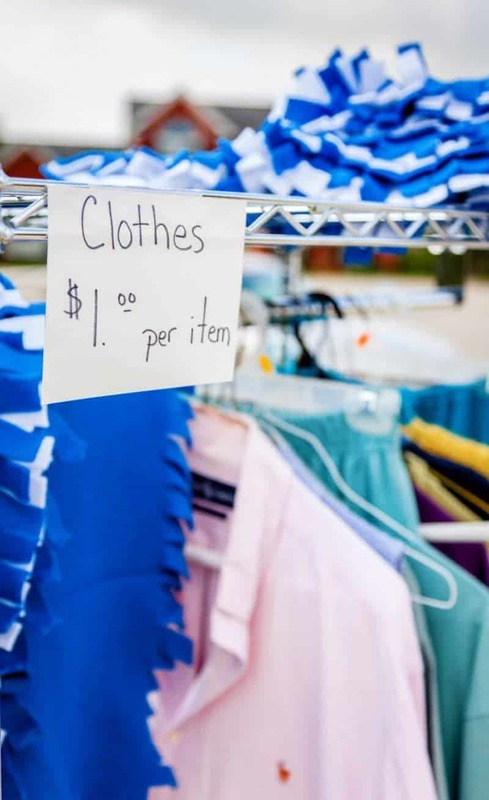 Use retail store-style signage at the garage sale. It can help to think of your garage sale kind of as a retail space. What signage would attract you to the items sold at your garage sale? This article details the many different types of signage that come together in a retail store to attract customers to different products. You’ll want to include signs highlighting good deals (e.g., “2 CDs for $1” or “$1 books”), signs designating different categories (e.g., “kitchen” or “textiles”), and a large “garage sale” or “yard sale” sign so that passers-by have no question as to whether or not you are holding a garage sale. These are great tips! I think we’re going to do a big family yard sale in the Fall. I love your ideas about posting to Instagram and using signage in your neighborhood. I will definitely implement these ideas! I wish I had theses tips when we moved last year! I will have to bookmark this for our next yard sale in the Fall. Never thought to advertise on Craigslist! i loveee garage sales, yard sales, thrifting. LOL. I used to go all the time with my mom and still it. We have this Goodwill that I shop at all the time and find some of the best deals. These are all great tips, thanks for sharing! 🙂 I love going to garage/yard sales, you never know what you will find! I have not had a yard sale in quite a while. It was super reading these tips and getting ideas for the future. I have to say that I am reluctant to garage sale due to the extreme heat. But these are some great tips. Not sure if I would be comfortable advertising on Craig’s list though. I agree with some of the other posters – I definitely notice good signage in advance of a yard sale. Thanks for sharing all this good information. Pinning now. Great tips! It really is all about the advertisement. These are all great ideas. We are getting ready to pack to move and there is so much stuff we need to get rid of. These are all great tips. Make sure that your neighborhood signs are large enough.